One of the leading car makers of the country, Maruti India is all set to launch their stylish Multi Purpose Vehicle – Maruti Ertiga in the domestic car market on the 12th of April. This new MPV will seat 7-passengers and the Maruti Ertiga price is expected to be in the range of Rs. 7.00 lakh to Rs. 9.00 lakh. The final price of this vehicle will be announced closer to the launch as stated by the company. 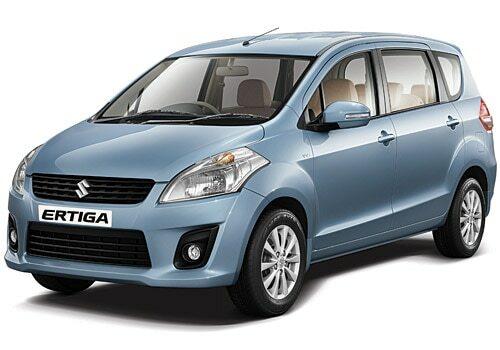 Maruti Ertiga will be offered in both petrol car and diesel car variant for the Indian car market. It is sufficiently spacious and has 3-rows of seating arrangement, which is quite proficient to give ample shoulder support, head as well as leg room to all its occupants. Maruti Ertiga pictures reveal the striking exteriors of this MPV with a sweeping back head lamp cluster and a pair of fog lamps fixed in the body colored front bumper. The rear end of this MPV is very straightforward and is equipped with a medium sized tail lamp cluster. The front bumper also has an air duct and the radiator grille is very slender, which also houses the company’s emblem on it. A Maruti Ertiga review states that the petrol version will be fitted with a 1.4 liter motor capable of producing 93.7 Bhp of power along with a torque of 13.26 Kgm. While, the diesel version is incorporated with a turbo charged diesel motor of 1.3 liter that has an ability to generate a power of 88.8 Bhp along with a pounding torque of 200 Nm. This Maruti's MPV also has a lot of advanced features and the company has also integrated high quality safety features for the protection of the passengers. Apart from this MPV, vehicles like Tata Safari Storme, Chevrolet Captiva and Volkswagen Jetta are all set for their launches in the coming month. I recently shared that Mitsubishi Outlander arrives with a price tag of Rs.20.55 lakh and Maruti eyes to create a city MPV niche with Ertiga.